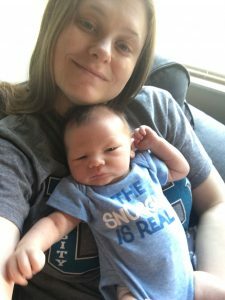 I could not wait not to be pregnant anymore and holding my son for the first time was one of the most magnificent moments of my life. He was made from scratch by God’s hand and is such a blessing. BUT, the first week of parenthood was a doozy. Leaving the safety net that is the hospital was probably one of the most terrifying moments of my life. I felt like at any time they would stop us from taking him, we were in no way qualified for this new role. But, they let us leave, saw us out, and home we went. My Son and I just hanging out during Week One. Duck for cover. If you have a boy, you will get peed on, Bernard and I both had this happened within the first week. Remembering to cover him before pulling the diaper back is essential. Uncontrollable crying – from me. The nurses said this is normal; your hormones are normalizing plus because I had a c-section this hormonal shift might be more intense. I hate crying, especially when I can’t stop it. One time while in the hospital, I told Bernard he could leave and run home and that I would be fine. Then I realized shortly after he went, that I couldn’t reach something I needed across the room to feed our son, who I was holding. I couldn’t easily get out of the hospital bed due to the c-section. I began balling, and I ended up being consoled by the nursing staff who happen to come into the room to check on me. I cried a lot once we returned home mostly while saying, “I have no idea what I am doing…” I am happy to report the uncontrollable crying has stopped. Newborns do three things: eat, sleep, poop/ pee repeat. You do get cute moments where they smile briefly or gaze at you and when those moments happen you cherish them especially when the days get monotonous. We cracked the secret of parenting very quickly, and it is this: It is the blind leading the blind out here, the wild wild west if you will. No one knows exactly what to do. You Google something, and you get fifty different responses all contradicting one another, books are the same. The secret to parenting is finding what works best for you and doing that. Restrictions after labor are the worst and may cause cabin fever. Sure, some may be excited to be told they have to be chauffeured around for four weeks and have a doctor’s note that says no housework for six weeks, but not me. After the third trimester that seemed to go on and on ( I went into labor a week after my due date) I am ready to move without a belly and not being able to is difficult and may have been contributing to my crazy-ness during the first week. Your lack of sleep may not be because of a crying baby, but because you get up 100 times throughout the night to make sure your baby is breathing. Babies make a lot of noises when they sleep, our son snores. During the first week, I jumped out of bed every sound he made, week two I had acclimated to his sounds. It takes a lot longer to get out the door when you add a baby to the mix. Is he fed? Do we have the diaper bag? Are there diapers and wipes in the diaper bag? Does he need to be changed? All of that plus making sure you have yourself together is a lot. You are the parents; you are now the authority. Bernard and I both have had moments with our mothers where they deferred to us as to what to do regarding our son. It was a weird shift where we realized we are now the ones calling the shots, not our parents. Week one was filled with lots of emotions. I found a quote that rang so true by the end of the week – when we had found our groove, it was said by Benjamin Spock, a pediatrician, and it goes, “Trust yourself, you know more than you think you do.” New parents are rightfully scared – they are now in charge of this little being that relies on them for all their needs. But, those instincts you hear about they are real, trust them. That has probably been the most significant lesson I have learned in the first week of being a mom. This entry was posted in Mamas and tagged baby, fathers, love, mothers, parenthood, parents, son.